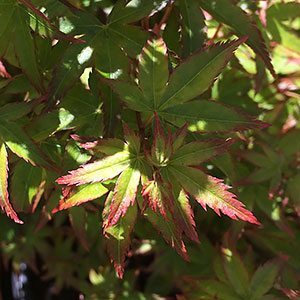 A small low growing maple, Acer palmatum ‘Murasaki kiyohime’ it will spread to nearly twice its own height. In terms of Japanese maples, this is also a reasonably fast growing variety. It can form a good sized feature in around 5 years. It looks stunning when planted in a rock garden or Japanese style garden. With its low growing nature, it can be used to under plant taller trees. Once established this is a very easy care maple. It s best when protected from the heat of the afternoon sun. Common Names – None recognised. Height – To around 1 – 2 metres, usually on the shorter side..
Foliage – Mid green with attractive new foliage margined with a deep scarlet red. Mature foliage is a mid green, orange to bronze and red in autumn. Flowers – Insignificant, red to green samaras in late spring.